The Bainbridge Township Fire Department, United States Fire Administration (USFA) and the National Fire Protection Association (NFPA) are working together to remind everyone that home fires are more prevelant in winter than in any other season. This is due in part to an increase in cooking and heating fires. Holiday decorations and winter storms that can interrupt electrical service and cause people to turn to alternative heating sources also contribute to the increased risk of fire in winter. 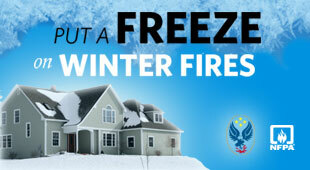 Winter fires can be prevented! The following fire safety tips can help you maintain a fire-safe home this winter season.